I’ve always dreamt of God of War contuining with a new protagonist, setting and mythology. And if a new leak is to be believed, God of War 4 may just grant that wish. One of the sources for this rumor is known industry insider Shinobi 602, who teased the Norse setting on Twitter. This was swiftly followed by NerdLeaks digging up concept art from the website of someone who worked for Sony Santa Monica Studio in late 2015. That website, plus NerdLeaks and their Twitter account, are now offline. However, Sony was not fast enough with their takedown to stop NeoGaf grabbing all the images. What we see in these images is a Kratos-like figure with a beard and axe, with an ability to cut vines and create bridges and walkways. 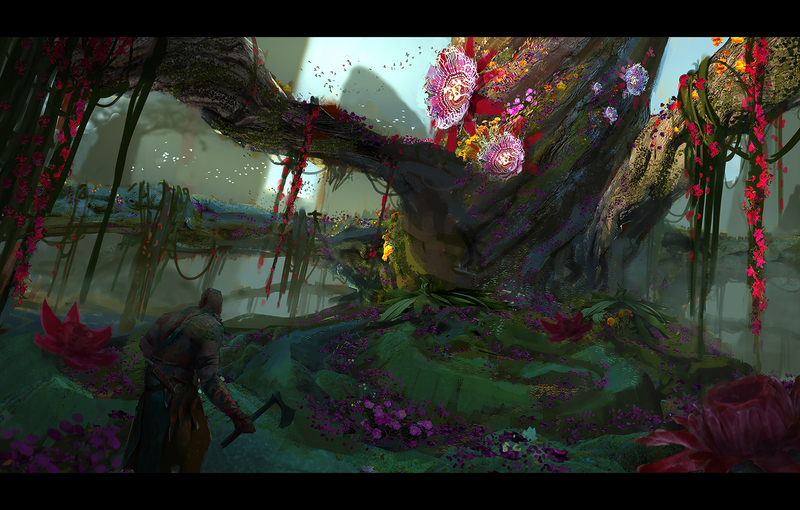 The environments shown in the concept arts include Alfheim and “Land of the Fairies”. It’s hardly shocking that Santa Monic and Sony would continue the hugely successful God of War franchise, and starting with a new main character and setting is definitely the way to go. Kratos’ story should have ended with God of War 2, but sadly we had to witness him become a parody of himself in God of War 3. There are whispers, however, that GoW4 will be on the Playstation 4K to make use of the extra horsepower that will allegedly provide. You can check out all the images here at NeoGaf. Tagged with god of war, god of war 4, gow4, images, leak, playstation 4, playstation 4k, rumor, screenshots, setting, sony.